Bruce A. Bush, age 68 years, of Raritan Township, NJ, died on Tuesday, October 16, 2018 in the Hunterdon Care Center, Raritan Township, NJ. Born in Somerville, NJ, June 2, 1950, he was the son of the late Robert F. and Dorothy Trimmer Bush. Bruce worked for many years in the Shipping and Receiving Department of Johanna Foods. 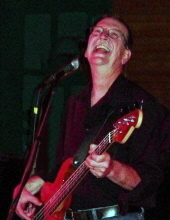 An avid musician, Bruce played the bass guitar and trombone in many bands, including Fragile, Bandito, 519 South, Kicks, Blackjack, Shotguns, and the Mojo Gypsies, as well as the Blues Brothers Tribute Band. In addition to his parents, he was predeceased by his sons, Matthew Bush in 2015 and Christopher Bush in 2014, and his brother, Robert F. Bush, Jr., in 2013. Surviving are his wife, Kathleen Dilts Bush; a granddaughter, Jocelyn Bush; nieces, nephews, and extended family. A Memorial Service will be held on Saturday, October 20, 2018 at 4:00 PM in the Holcombe-Fisher Funeral Home, 147 Main Street, Flemington, NJ. Interment will be private in Three Bridges Cemetery, Three Bridges, NJ. Calling hours will be held on Saturday from 2:00 PM until the time of service in the funeral home. "Email Address" would like to share the life celebration of Bruce A. Bush. Click on the "link" to go to share a favorite memory or leave a condolence message for the family.